It'd be very hard for me to write a proper review of this album, because it's one of my all-time favourites, and definitely included in my personal top-5. In short, "Marsbéli Krónikák" present everything what I love Hungarian prog-rock for: catchy and beautiful melodies, atmosphere of bright sadness, excellent musicianship, analog synthesizers from the 80s, and the influence from sci-fi classics like Ray Bradbury and his "Martian Chronicles". Even though the album is entirely instrumental, it accurately reflects the mood of "Martian Chronicles" and a lot of other "hard" science fiction of the 20th century. 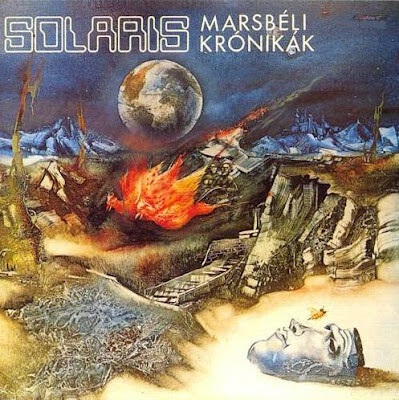 That probably what The Martians would listen to, if they were born half a century later :) I should also note that Solaris is progressive rock, but not avant-prog; so it's sophisticated enough, but isn't hard for listening at all. A true masterpiece, perfect example of good Eastern European prog-rock sound.